The St. Joseph Joes have not been idle these past few weeks. They have been swinging the bat well according to Manager Pat Schneider, and pitching has been in top form. And that helped to put them in the middle of the dogfight for a league title. On July 28, Joey Atkinson pitched almost five innings givsing up seven hits and collecting four strikeouts and four walks. But the hits came in bunches and allowed the Sartell Muskies to put up seven runs. Alex Kendall came in and allowed one hit and got three strikeouts allowing no runs. Atkinson was tagged with the loss. It was an important game for the team, Schneider said. 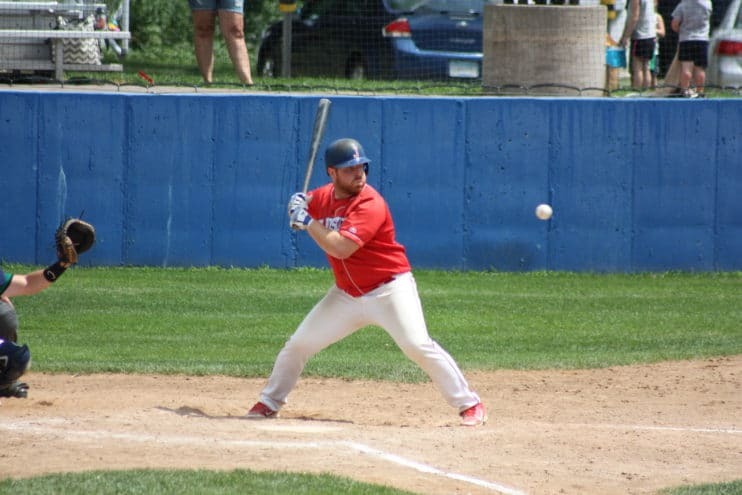 Schneider was more than a little pleased with the grit his team showed against the Foley Lumberjacks in their July 22 game at Foley. In a previous game the Jacks had pummeled the Joes (13-5) pretty good, so this was a chance for revenge. Foley jumped out to a one-run lead in the the second inning and held on like pit bulls until the sixth inning when St. Joseph pushed four runs across to take the lead. But Foley wasn’t finished and answered with two runs of their own in the bottom of the seventh. With only a one-run difference between them, St. Joseph managed to push across another run in the top of the eighth inning and the score stood 5-3. But Foley was not finished and scored one more run of their own. Going into the ninth inning the score was 5-4. From there on, St. Joseph chomped down like a pit bull on a ham bone and held the Lumberjacks off to collect a 5-4 win. St. Joseph smacked nine hits around the ballpark including three doubles. Atkinson was the winning pitcher throwing for 5-1/3 innings, giving up three runs, striking out two. Alex Kendall finished out the rest of the game giving up one run and throwing four strikeouts. 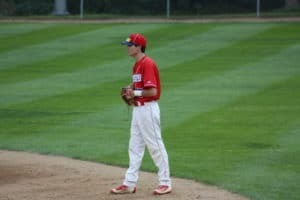 On July 21, the Stone Poneys of Sartell visited Schneider Field in St. Joseph and gave the Joes a tough game to remember. Matt Maurer of the Stone Poneys faced off against Greg Anderson of the Joes. It was a hare and hound kind of game with the Poneys quickly scoring two runs in the second inning and another in the fifth giving them a 3-0 lead in the top of the fifth. The Joes managed a run in the fifth to make it 3-1. and added runs in the sixth and eighth innings to tie the game going into the ninth inning. The game came down to the last swing of the bat in the ninth when the Joes put together enough hits to push that fourth run across for a 4-3 win. 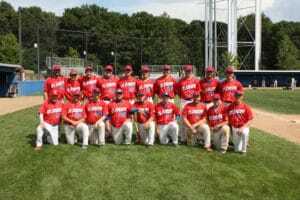 It was a hitters field day with the Poneys corralling 10 hits and the Joes gathering 13. The problem was trying to string together several hits in a row to push the runs across. Poney Jake Light smacked one big bammer over the fence, and team mate Shawn Lindsay smacked a double, but mostly it was single after single for both teams. RJ Alpers of the Joes managed a pair of doubles. In the first round of Region 11C Tournament at Watkins, the Joes lost to Kimball, 2-0. The Joes play Foley this Saturday, Aug. 4 at 11 a.m. If they win they play again at 4:30 p.m. for a state tourney birth. Both games are in Watkins. Other teams playing for a chance to move on to the next level include Luxemburg, Foley, Clear Lake, Pearl Lake and the Sartell Muskies. Check bracket for times and dates or go to http://www.mnbaseball.org/page/sections-regions for all the section and region brackets. Just click on 11C and the bracket and times should pop up. Brandon Bloch eyes a fat pitch to drive somewhere they ain’t during the game against the Sartell Muskies. Charles Vaughan stands at the edge of the infield looking in and waiting to spring into action if the ball should come his way. The St. Joseph Joes 2018 Baseball team. Kneeling: (left to right) Pat Schneider-manager, Brandon Bissett, Burke Tagney, Willie Willats, Hunter Blommer, Tanner Aleshire, Brandon Bloch, Nick Gill and Peter Nelson. Standing: (left to right) Craig Hern, Charles Vaughan, Caz Novak, Zach Overboe, RJ Alpers, Tanner Blommer, Alex Kendall, Isaac Holthaus, Ben Alvord, Joey Atkinson.